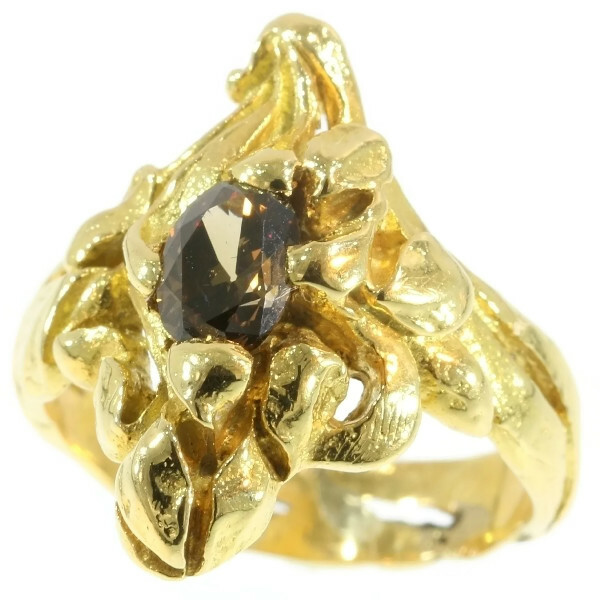 Art Nouveau yellow gold flowery ring diamond, French jewelry: Description by Adin Antique Jewelry. This 18K yellow gold Art Nouveau ring from 1900 has grown an iris to grasp a natural fancy colour old cut oval diamond of 0.80 carat. The scintillating fire within the warm brown diamond and the elegance of the iris compel you into an ambiance of vitality and purity while the gold shank swirls around your finger.